Stop & Go Station is the ninth level of Donkey Kong Country and the fourth level of Monkey Mines. Rock Krocs make their only appearance in this level. Stop & Go Station takes place inside a mine shaft. By default, the level has a green hue, and there are Rock Kroc enemies moving around in most parts of the level. 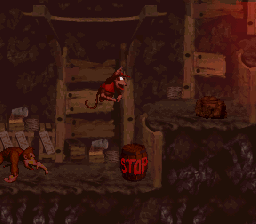 The Kongs cannot safely go through the level while the Rock Krocs are running around, otherwise they are injured. The level is divided into segments by the Stop and Go Barrels, which are used to temporarily immobilize the Rock Krocs. When they hit one of these barrels while it reads "GO", it turns to "STOP", and the whole area is covered in a red hue. After a few seconds, the stage and hue revert back to "GO", and the Rock Krocs start moving around again. This means the Kongs must traverse through the segment and to the next Stop & Go Barrel before the Rock Krocs wake up. Each Stop & Go Barrel is in effect at a different length from each other—the last few before the level exit are only in effect for one second before reverting to the default "GO". This is the only level to feature Rock Krocs and Stop & Go Barrels alike, and the only other enemy are Klaptraps, who first appear in this level. In the Game Boy Color port, the Bonus Areas have a green lighting to them like the main stage, despite Rock Krocs not appearing in either Bonus Area. In the same port, Stop & Go Station also utilizes the mine background while original version and Game Boy Advance port uses the boardwalk background. The primates stand in the beginning portion of the level. 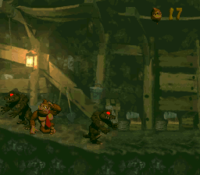 At the beginning of the level, the Kongs exit a small tunnel and make their way towards several small ledges. After dropping down the second ledge, they find a Klaptrap and a barrel switch that displays the word 'Go'. Once they hit it, the Rock Kroc dashing in the small area of land ahead crouches into a ball, allowing the primates to cross. A DK Barrel and another barrel switch is located nearby, and they are followed by several ledges with more Rock Krocs on the edge of them. The Kongs can find a Klaptrap on the top ledge, which is followed by a lower area containing the letter K and a tire that can assist them in crossing a pit and reaching a barrel switch high in the air. Two Rock Krocs race in the small area after here, avoiding another pit found farther ahead. On the opposite side of this abyss, the heroes can find a flat piece of ground with a Klaptrap on it and a barrel switch above it that they can hit to flip the color of the lights, causing the Rock Krocs to curl into balls if they are not already in their hiding position. An abyss can be found after the barrel switch with a small platform guarded by a Rock Krocs in it. The primates are able to locate a pair of Klaptraps and an additional barrel switch on other other side of the pit. Two more small pits are ahead of here, and the platform surrounded by them holds a pair of Rock Krocs. Another barrel switch is also in the second abyss, which is followed by an additional pit that can only be crossed with the use of a moving platform that is occupied by a Rock Kroc. The Kongs can discover a DK Barrel and another barrel switch on the other end of the drop. They are followed by an additional pit with several ledges after it. Most of the ledges hold Rock Krocs, but others carry Klaptraps. At the top ledge, the heroes can find a small pit containing the letter O and then the level's Star Barrel. Donkey Kong is attacked by some Rock Krocs. If the Kongs continue forward, they drop down a tall ledge with a barrel next to it, which is supported by a smaller ledge that is followed by a flat area with a Rock Kroc and a barrel switch on it. Another Rock Kroc runs in a lower area located just before a higher area of ground that supports a Klaptrap. The Kongs can find a trio of Klaptraps in a slightly lower area nearby with a wall of bananas in front of it. After climbing a ledge found ahead of the enemies, the primates reach an area containing a DK Barrel and a tire that they can roll towards a barrel switch found high in the air. The tire can help them bounce to the switch, which then causes the Rock Krocs to roll up into a ball for a limited amount of time. A few Klaptraps march around the area, which is followed by a wide abyss containing several small platforms, each being guarded by a Rock Kroc. A Klaptrap attacks the heroes as they access the other end of the abyss. Two alcoves are located ahead of here, and a Klaptrap and the letter N stand in the small space between them. Another Klaptrap is located just before another abyss with a barrel switch above the beginning of it. Two platforms occupied by Rock Krocs hover in the abyss, moving back and forth in a horizontal path. They can be used to help the heroes cross the abyss and reach an area containing a sign that indicates that the level is near complete. The duo can find two barrel switches along a flat stretch of land ahead of here. Several Rock Krocs cover the pathway. A tire sticks out of the end of the land, which can be used to reach another barrel switch placed high over a slightly lower stretch of land. This land is also infested with Rock Krocs. A tire stands on it that can be rolled under the next barrel switch so that the heroes can bounce up to it. A few ledges are also ahead, leading into a raised area of ground containing a few more Rock Krocs. At the end of this area, the two friends can locate the letter G on a ledge that is followed by a exit sign. If the Kongs walk into the tunnel ahead of here, they complete the level. Expresso After the letter K, the Kongs have to travel across some more pits and avoid some more Rock Krocs and Klaptraps. When they find the second Rock Kroc on the floating platform, they must quickly jump from the left to reach the Expresso Token. Find the Exit! After crossing the Star Barrel, the Kongs can notice a barrel lying in plain sight. They must pick it up and carry it, and walk into a Stop and Go Barrel along the way. There is a wall behind the second Rock Kroc, which the Kongs must break to enter into the Bonus Area. In the Bonus Area, the Kongs have the option to shoot in a square path with four Barrel Cannons, collecting Bananas along the way. There is a Banana Bunch in the center of the area. 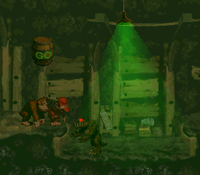 The Kongs can exit either by falling down the pit or from the exit on the right side. Collect the Prizes! After exiting the first Bonus Area, the Kongs can go a bit further to discover three Bananas arranged vertically in midair. They must go a bit further to find a tire, which they must roll back to the area with the three Bananas. They must then bounce up to the Bananas which lead directly above into the Bonus Area. In the Bonus Area, the Kongs are inside of a vertical-facing Barrel Cannon, and can blast straight into the prizes, which are arranged in three columns. Each column has ten single Bananas and a collectible at the top. The first two columns have a Banana Bunch at the top while the third, latter column has a Winky Token. After blasting up, the Kongs either fall down the pit or land back into the Barrel Cannon; by missing the Barrel Cannon, they return into the main level. Sticker Pad (GBC version) The Sticker Pad is hidden beneath a gap just right a Klaptrap and the letter N. As with other Sticker Pads, Donkey Kong must Hand Slap on to the patch to unearth it. Photograph (GBA version) After the Expresso Token, the Kongs must continue onward and pass a DK Barrel. After crossing to the next platform, the Kongs must go left to find a photograph floating over a pit. They can reach it by using a roll jump. The photograph is of Rock Kroc, who appears in the fourth page of the scrapbook. The letter K is floating in midair just after the second Klaptrap. After the Expresso Token, the Kongs must go a bit further and climb up a few wide stairs with two Klaptraps and two Rock Krocs. The letter O is hovering in the following pit, and a roll jump is required to obtain it. About halfway in the level, the Kongs must jump from several small platforms, each guarded by a Rock Kroc, across a pit. The letter N is floating above a Klaptrap who is standing on a platform between two very narrow gaps. The letter G is located right before the level exit, on the same platform. The Warp Barrel appears in the level entrance at the very start. By walking back into it, the Kongs are teleported near the end of the level, just at the arrow sign indicating the nearby level exit. This warp appears in all three versions of the game. Diddy walks into a 'Stop' barrel. The Kongs standing at a chasm. The Kongs bouncing at a Stop and Go Barrel from a tire near the level exit. Diddy standing at the first Bonus Area's exit. The Kongs running through the level just before the Stop & Go Barrel reverts back to "GO". This page was last edited on April 5, 2019, at 12:29.